It’s no secret that businesses want to succeed. It also should be no surprise that their employees want to succeed! Of course, there’s often a strong, positive relationship between the two—when employees succeed, so do the organizations they serve. A key question, then, becomes: How can organizations most effectively encourage and support their employees’ success? 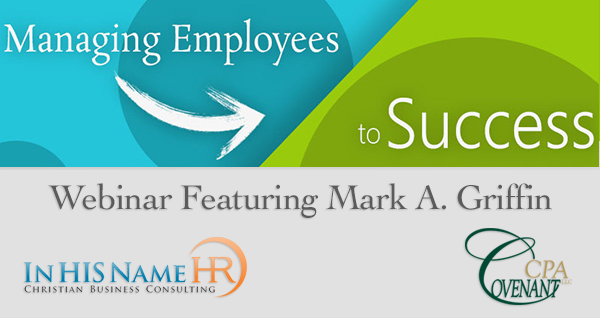 Mark Griffin, founder of In HIS Name HR and a professional with more than two decades of experience working with high performance organizations, is uniquely qualified to explore this question. Managing Employees to Success promises to be an interesting and interactive event that will offer fresh ideas and productivity-enhancing insights for employers and employees alike. A Link to the Webinar presentation page will be e-mailed closer to the date of the event. • Employee relations and communications. • Counseling and discipline procedures.